For my birthday I ordered some lovely tea from Stéphane over at Teamasters. 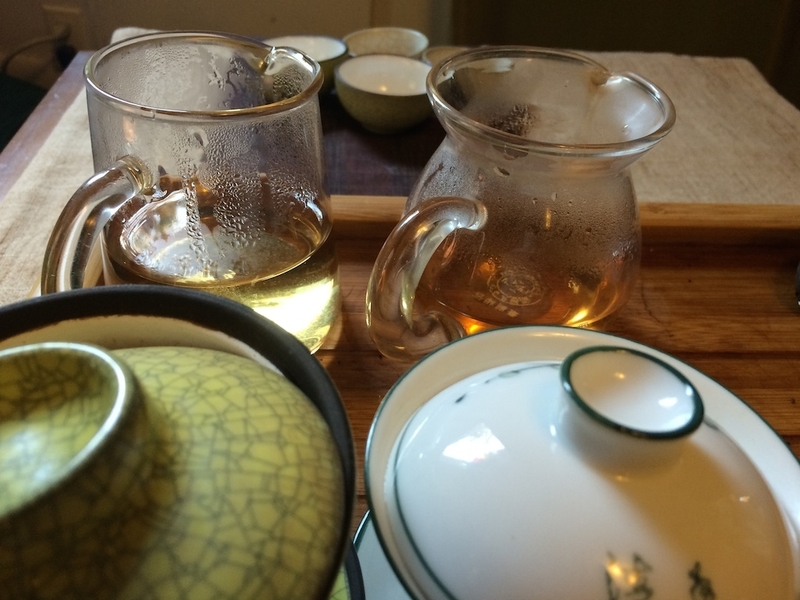 Most of what I ordered was one of my favorite tea styles, Hong Shui (“red water”) Oolong. 红水乌龙茶 is a style that has fascinated me ever since I first encountered it in Taiwan some three years ago and it’s not a type of tea that’s found very easily, at least on the Western market. Apparently it’s a challenge to produce. Despite all the effort that several blog posts have made to explain the processing, I still have trouble putting into words what makes this tea so unique. Once you’ve tasted Hong Shui, however, you won’t easily forget it. Based on my understanding (and I’m certain you can find something there to criticize), Hong Shui is a slow and careful roasting of a flavorful rolled oolong. The roasting lasts a long time compared to other oolongs, interspersed with several resting periods to avoid over-baking the leaf. It requires great skill to produce the stone fruit flavors of Feng Huang and the charcoal dryness of Wuyi-style Yancha in a Dong-Ding-style oolong, often from a High Mountain (> 1000 meters) garden, without losing the sweetness of the underlying leaf. High Mountain Hung Shui Oolongs are made with Oolong leaves that have been sufficiently oxidized to receive a slow and deep roast while preserving their mountain characteristics: freshness, lightness and elegance. Like for the best Wuyi Yan Cha, the roast is lightest and skillfully done when the underlying quality of the leaves is the highest! The leaves open up very well and turn green quickly again. The taste of a Hong Shui is something between a great Da Hong Pao and a great Dong Ding: dry hay with an almond sweetness. Despite the name, the liquor of the Hong Shui that I’ve infused tends to be a light gold with only a hint of red. In fact, if I let the color get to a dark orange, the taste becomes overly strong. I purchased four examples to taste and it was fascinating to compare the differences. My favorite of the bunch was the 2013 Winter San Lin Shi Hong Shui. The brownish-green leaves have a heavenly aroma when warmed. A little bit like roasting butternut squash combined with the sweetness of ripe pear. After a few infusions I noticed the taste of smoked wood. It was something like almonds or cinnamon bark: a delicate sweetness underneath a woody flavor that lingers in the mouth. My second favorite was the 2014 Spring harvest Hong Shui Dong Ding. This more recent harvest had a little more energy than the others, and its taste was also remarkable, though less dramatic. The remaining pair were 2013 Winter Hong Shui from Yong Lung (a village near Dong Ding mountain), both the “regular” and the “strong” style. These were surprisingly light bodied compared to the San Lin Shi. The “strong” version (“fort”, en Français) had a pronounced apricot aroma much like a Feng Huang. In fact, by smell alone I probably would have said “Phoenix” without a second thought. The taste of these teas was definitely in the Hong Shui category, though. A little bit of ash and hay in the flavor, sweet hidden under layers of toasted grain. One thing I noticed when making these teas was that, just like Stéphane experienced, it’s definitely possible to brew them without bringing out the energy of the leaves. 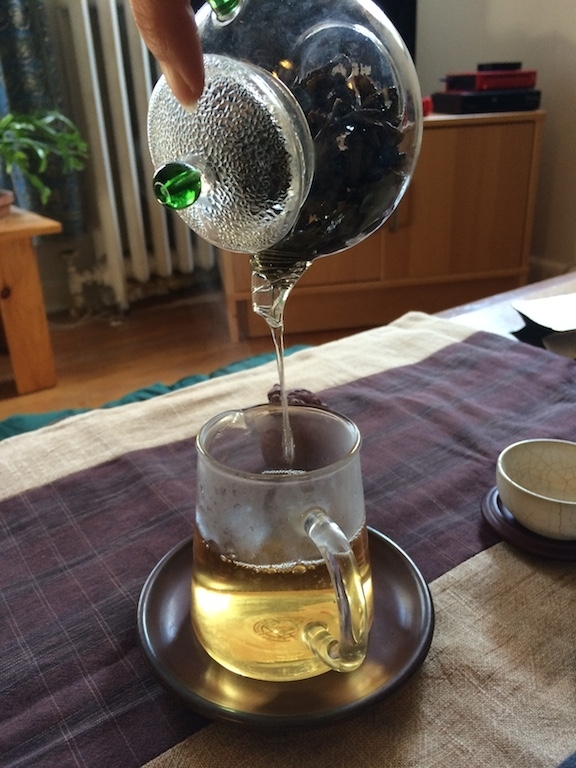 My first few infusions of the Yong Lung were very bland. The “strong” also had a notable sour taste, but that tea was rolled more tightly and with fewer full leaf sets, which might have added to its potency. I quickly learned to use fewer leaves than my usual 4g and make sure my water was very hot. This is one of the occasions where the speed and energy when pouring the water into the teapot makes a difference in the results. My first attempts were poured from a thermos that spread the water flow out into a band, but when I used a strong water stream directly from the kettle both the Yong Lung teas tasted much better. Both took on a thicker mouthfeel and a sweet aroma. Clearly I still have a lot to learn! The most remarkable thing for me (particularly with the San Lin Xi) was the comforting Cha Qi of these teas. That is what draws me to this style like nothing else. The smooth and relaxing feeling that permeates my body when sipping these Hong Shui is reason enough to choose this unique tea style out of my collection, and I hope you get a chance to try it as well. 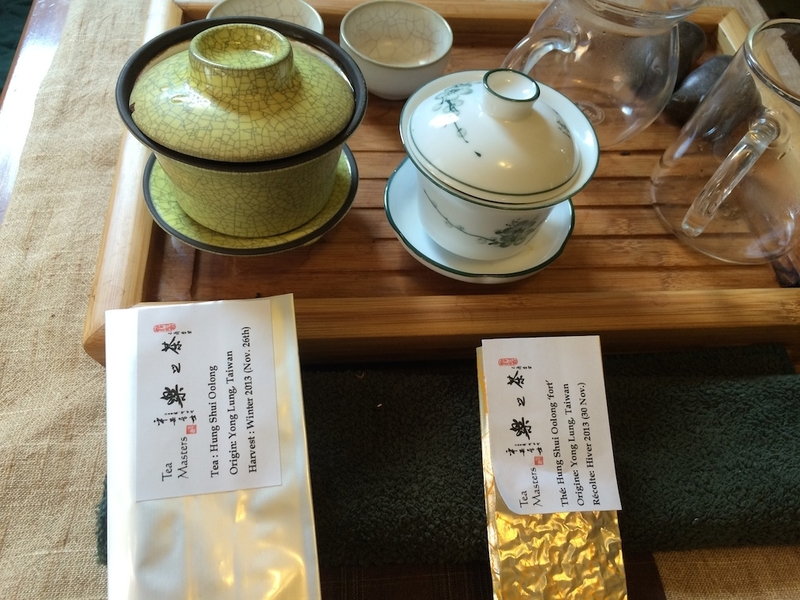 This entry was posted in Tastings and tagged oolong, taiwan, tea preparation, teamasters on October 1, 2014 by payton.